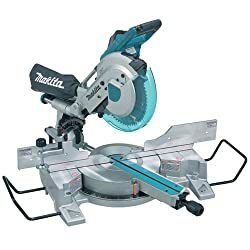 Why is it so hard to find a versatile miter saw? Some miter saws are designed to trim windows or doors, while others are great for all types of cross cuts and angled cutting projects. No two miter saws are designed the same way. However, finding a versatile, affordable miter saw shouldn’t have to be such a long and exhausting process. 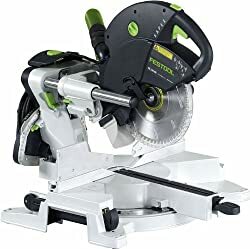 That’s why we composed in-depth review of the best miter saws of 2019. For you, our loyal readers and fellow power tool enthusiast, we’ve collected, researched, and reviewed the top 20 best-selling miter saws of 2019. Are you looking for a basic woodworking tool? 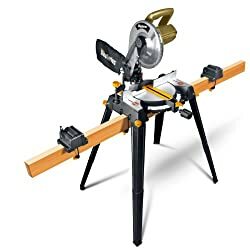 How about a miter saw for cut framing lumber? Regardless of what you’re looking for, you’re guaranteed to find it in this article. Our top 20 choices are not only affordable, but also long-lasting. Lightweight and user-friendly, each of our favorite miter saws are great for both novice and experienced carpenters. Go ahead and take a look at our in-depth review. You’re guaranteed to find exactly what you’ve been looking for. Before we take a look at our top miter saw reviews, let’s check out our comparison table. To help you choose the best miter saw for cutting crown molding, framing, or more, we’ve composed an in-depth comparison table. Our comparison table will help you find the perfect unit for cutting cabinet and furniture parts, currently on the market. So, I encourage you to check out our table of the top 20 miter saws of 2019 and the top manufacturers. In this comparison table, we compared our top 20 choices by size, dimension, voltage or amperage, corded or cordless design, warranty, and included equipment. We chose to look at the unit’s dimension and size because these provided an idea of how large and portable the miter saw was. Then we analyzed voltage, amperage, and corded design because these factors can determine how powerful units were. The included equipment and warranty categories provided some idea of what is included with the purchase. Now let’s take a moment to look at our in-depth reviews of our top 20 miter saw choices. In this next section, we’ll be looking at the pros and cons of each miter saw. We’ve also reviewed each unit’s best additional features and functions. Why don’t you go ahead and take a look at what we’ve found? First on our list is the ever impressive Bosch GCM12SD DB Glide Miter Saw. The Bosch GCM12SD DB Glide comes with a powerful 15 amp motor that’s pre-wired to handle 120 volts. Its blade diameter is 12 inches long and it features a cord length of 6 feet for additional length. This power tool features a max rpm no load speed of 3,800. It comes with a clear lower guard for higher visibility while in use. This unit also features a 14-inch horizontal capacity, as well as a 6 1/2-inch vertical capacity. The Bosch GCM12SD DB is a dual-bevel miter saw that’s capable of cutting at angles ranging from 0 to 47 degrees. It comes with a metal bevel lock lever for quick and easy adjustments. This miter saw comes equipped with a compact axial-glide system which guarantees smooth cuts and complete control. It’s capable of perfectly completing crosscuts, as well as, extending your tool’s lifespan by providing smooth glides and enhanced alignment. It also comes with a Quick-release Squarelock fence for precise alignments. This feature provides a 90-degree cut with no additional adjustments. Unfortunately, the Bosch GCM12SD DB is one of our more expensive choices. It’s not a product that’s meant for simple DIY projects or occasional work. For some reason, this miter saw struggles to make square cuts or cross cuts. This is actually a common complaint among customers. If you notice this, then I recommend trying to adjust the miter or bevel to make sure it’s accurate. You can also check the fence to make sure it’s perfectly perpendicular to the first cut. 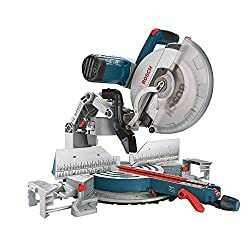 The Bosch GCM12SD DB is definitely one of the best miter saws for light contracting work. It’s not fairly heavy, small, compact, and very portable. It also comes with a 30-day money back guarantee, as well as, a 1-year warranty. The warranty protects against product defects in materials and workmanship. This compound miter saw comes with the following attachments and accessories: 10-inch 24-tooth TCT saw blade, vice assembly, extended fence, box wrench, and dust bag. The Bosch GCM12SD DB Miter Saw is a great option for contractors and professionals. It’s definitely one of our top favorite choices. Next on our list is the DEWALT DWS780 Double Bevel Sliding Compound Miter Saw. This dual-bevel miter saw comes equipped with a 15 amp motor that’s capable of performing up to 3,800 RPM. It features a simple, hassle-free bevel system that can perform between 0 to 49 degrees from any angle. This miter saw can also reach a solid 60 degrees on its right side. It comes equipped with a cam lock miter button for locking the bevel between detents. This provides precise adjustments with every change. The DEWALT DWS780 Compound Miter Saw comes with an XPS Cross-Cut Alignment System. This system features an ultra-bright LED light for higher visibility while cutting. It requires no future calibration and guarantees accurate cuts with every use. This miter saw comes with a 6 ¾ inch vertical capacity, a 13 7/8-inch horizontal capacity, and a 7 ½ -inch nested crown capacity. It comes with a back fence that cuts at a 90-degree angle up to 2 x 16 inches. 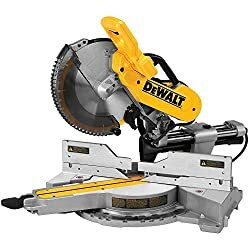 There’s not much that I can say about the DEWALT DWS780 Compound Miter Saw in terms of negative features. Overall, it’s a great miter saw. However, it’s important to note, that it doesn’t come with a stand like it’s supposed to. It also has a tendency to slide a bit while in use. So, make sure that you keep it tightly latched to a firm surface. The DEWALT DWS780 Compound Miter Saw is the perfect option for both light and heavy use. It features a sturdy, durable stainless steel design for a longer lifespan. Just in case, it also comes with a 90-day money back guarantee and a 1-year free service contract. It also comes with a 3-year limited warranty that protects against product defects in materials and workmanship. This compound miter saw comes with the following attachments and accessories: dust bag, carbide blade, vertical material clamp, and blade wrench. The DEWALT DWS780 Compound Miter Saw is one of our favorite choices. If you’re looking for a power tool for heavy duty, industrial work, then this is your best bet. The Makita LS1016L Dual Slide Compound Miter Saw is next with a 15 amp motor that’s capable of performing up to 3,200 rpm. It features a compact, portable design that makes it perfect for maneuvering and taking from location to location. This miter saw comes with a patented 4-Steel Rail Sliding System which improves rigidity for superior cuts. It also comes equipped with 6 linear ball bearings for better, more accurate cuts. Its max capacity for vertical cuts is set at 6 5/8 inches and 12 inches for crosscuts at 90-degree angles. The Makita LS1016L Dual Slide Compound Miter Saw has a wide angle range. Its range reaches from 0 to 52 degrees on its left and 0 to 60 degrees on its left. Also, its positive stops include o, 15, 22.5, 31.6, and 45 degrees from left to right. This miter saw comes with an ergonomic grip for comfort and longer usage. It also features a clear blade guard system for increased visibility and convenience. Finally, this unit features Deep and eXact Cutting Technology for larger, deeper clean cuts. Unfortunately, the Makita LS1016L Compound Miter Saw’s side bar tends to accumulate a ton of grease. So, make sure that you clean the power tool regularly. Also, double check that the blade is firmly in place before using the appliance. There have been a few customer reviews that suggest that the blade becomes flimsy after a short while. The Makita LS1016L Compound Miter Saw weighs only 52.2 pounds which is fairly lightweight for an industrial-quality miter saw. It’s capable of performing with a variety of 10-inch blades and can perform a wide array of projects. These include trimming, furniture work, and house work. It also comes with a 1-year warranty that protects against product defects in materials and workmanship. This compound miter saw comes with the following attachments and accessories: blade, vertical clamp, dust bag, triangle, and wrench. Even though the Makita LS1016L Compound isn’t the lightest miter saw on our list, it’s pretty easy to take around. Actually, it’s heavier build helps it stay stable and firmly in place while in use. Next on our list is the DEWALT DW715 Compound Miter Saw. This single-bevel compound miter saw is equipped with a 15 amp motor that features a no-load speed of 4,000 rpm. It comes with an adjustable stainless steel detent plate that features 11 positive stops. Also, it comes with 4 steel bevel stops for convenience and versatility. This compound miter saw has a max crown molding of up to 5 ¼ inches and a vertical base molding of 6 ½ inches. Its range reaches from 0 to 48 degrees on the left and 0 to 3 degrees on the right. It comes with a cam lock miter handle for quick and easy adjustments. The DEWALT DW715 Compound Miter Saw is crafted to hold any variety of 12-inch blades. It also comes with a handy carrying handle for portability and maneuvering. 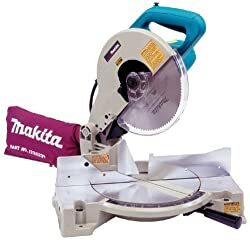 This miter saw comes equipped with a dust bag which is perfect for collecting wood shavings and dust. It’s also great for preventing dust build-up which may cause malfunctions and fires. The DEWALT DW715 Compound Miter Saw’s blade tends to loosen fairly easily. This is extremely noticeable when cutting 1-inch materials or less. Also, the dust bag tends to fall off while the miter saw is in use, which can be very annoying. The DEWALT DW715 Compound Miter Saw is a lightweight, compact product that’s great for both novice and experienced contractors. It comes with a 1-year free service guarantee, as well as, a 90-day money back guarantee. Along with everything else, it comes with a 3-year limited warranty that protects against product defects in materials and workmanship. This compound miter saw comes with the following attachments and accessories: carbide blade, dust bag, and blade wrench. 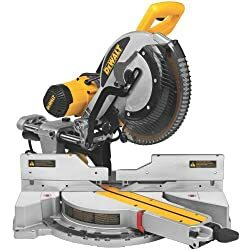 The best thing about the DEWALT DW715 Compound Miter Saw is that it’s affordable. It’s a low-cost miter saw that performs like an industrial-quality unit. The Evolution Power Tools RAGE 3 Multipurpose Miter Saw comes up next. This miter saw comes with a 15 amp motor that’s capable of reaching up to 2,500 rpm. It also comes with a 10-inch RAGE 3 multipurpose cutting tool which is designed with 28 teeth for ultra-fine cuts. This miter saw is perfect for cutting a variety of materials, including steel, wood, aluminum, plastic, and nails. It’s a double bevel slide miter saw that has a max crosscut capacity of 12 inches along its right and left sides. At a 45 degree angle, its max crosscut capacity is 8 ¼ inches. The Evolution Power Tools RAGE 3 Multipurpose Miter Saw is CSA certified to perform safely and effectively. It comes with a 1 ½ -inch dust port which is perfect for clearing away shavings and debris. This miter saw also comes with a cord and a heavy large base for extra stability. It’s capable of holding a variety of 10-inch blades for multipurpose work. It also comes with an extendable fence guard for perfectly straight cross and square cuts. Unfortunately, the Evolution Power Tools RAGE 3 Multipurpose Miter Saw is not the best for cutting steel. It tends to chatter a bit and leaves rough cuts. Also, if you need to cut iron, this miter saw may not be the best option for you. The Evolution Power Tools RAGE 3 Multipurpose Miter Saw is a low-cost unit that’s great for casual and novice carpenters. It also comes with a 3-year warranty that protects against product defects in materials and workmanship. 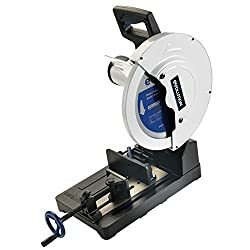 This compound miter saw comes with the following attachments and accessories: 60 tooth carbide blade, extension bars, dust bag, and table clamp. While it might not be one of our favorite choices, the Evolution Power Tools RAGE 3 Multipurpose Miter Saw performs well enough for light contracting work. It’s a good option that’s guaranteed to last years. The Hitachi C10FCE2 Single-Bevel Compound Miter Saw comes equipped with a 15 amp motor. It’s a powerful miter saw that’s capable of reaching a no-load speed of up to 5,000 rpm. This is an incredibly impressive rpm speed for a low-cost miter saw. It features a max miter adjustment of up to 52 degrees on both its left and right sides. This miter saw also comes with an extended flip fence which can reach a maximum 4 inches for large projects. It also comes with a dust collector for reducing dust and shaving build-up. This is particularly helpful for preventing malfunctions or fires in the work space. The Hitachi C10FCE2 Compound Miter Saw comes with a 10-inch blade that’s designed with 24 teeth. This allows for thinner cuts at all angles. It also comes with an ergonomic elastomer grip for comfortable, long usage without irritating vibrations or slips. It’s a powerful power tool that works with a wide array of materials, including wood, soft fiberboards, plywood, aluminum, and hard board. It’s important to note that the Hitachi C10FCE2 Compound Miter Saw’s dust bag is a bit faulty. It sometimes slips during use and struggles to capture shavings and dust. This miter saw doesn’t work well with steel or hard materials. Also, its blade guards can sometimes be pre-set too tight, which causes malfunctions. So, it helps to check before using this product. At 35 pounds, the Hitachi C10FCE2 Compound Miter Saw is a portable and lightweight miter saw. It’s a corded power tool that’s pre-wired to handle up to 120 volts of electricity. It also comes with a 30-day money back guarantee, as well as, a 1-year warranty. The warranty protects against product defects in materials and workmanship. This compound miter saw comes with the following attachments and accessories: 10-inch 24-tooth TCT saw blade, vice assembly, extended fence, box wrench, and dust bag. 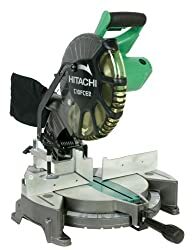 The Hitachi C10FCE2 Compound Miter Saw is a great product for casual carpenters. While it’s not powerful enough for a professional, it’s a great, low-cost option for occasional work or DIY projects. The Black+Decker M2500BD5 Compound Miter Saw comes equipped with a 15 amp motor and pre-wired to handle 120 volts. At 24 pounds, it’s a lightweight and compact option for a portable miter saw. It’s a powerful power tool that’s capable of reaching up to 4,800 rpm. Its miter range reaches from 0 to 47 degrees on both its left and right sight. It also has a bevel reach from 0 to 45 degrees on its left side. This miter saw is made of durable die-cast aluminum for a longer, sturdier lifespan. It also comes with a 24 teeth carbide tipped saw blade for cutting moldings. The Black+Decker M2500BD5 Compound Miter Saw is capable of holding any 10-inch blade. It features a sturdy dust bag for preventing dust and shaving build-up. Its additional hold down clamp keeps the material firmly in place while the miter saw is in use. This compound miter saw is a great option for small household projects and DIY-ers. It’s important to note that the Black+Decker M2500BD5 Compound Miter Saw doesn’t come with a fence. It doesn’t really come with many features and additional accessories. This miter saw also has the tendency to overheat and shut down when used on long projects. The Black+Decker M2500BD5 Compound Miter Saw is a fairly simple power tool that’s great for new carpenters. It’s also extremely affordable and less pricey than many other miter saws on our list. Unfortunately, this unit doesn’t come with a warranty or money back guarantee. However, it does come with the following attachments: 24T carbide tipped blade, dust bag, blade wrench, hold down clamp, and manual. Considering its cost, the Black+Decker M2500BD5 Compound Miter Saw easily outperforms its class. Overall, it’s great miter saw that accomplishes exactly what it was designed to do. This next miter saw is another low-cost, yet high-quality power tool. The Delta Power Tools Homecraft H26-260L Compound Miter Saw comes equipped with a 14 amp motor. It’s also capable of reaching a max speed of 5,500 rpm. This miter saw comes with a 6-foot cord for a longer reach and convenience. It also features an ergonomic grip for comfort during long periods of use. Its bevel is capable of reaching between 0 to 47 degrees along its left and right side. It also features stops at 15, 22, 30, and 45 degrees. The Delta Power Tools Homecraft H26-260L Miter Saw comes with a spindle lock hold for securing the spindle during blade changes. It features a battery operated laser for perfectly aligning the blade which guarantees straighter and better cuts. Its LockOut function prevents the miter saw from turning on when not in use. It also comes with a handy Arbor Lock which locks the blade in place and allows for quicker, simpler blade changes. The Delta Power Tools Homecraft H26-260L Miter Saw’s clamps may not be big or sturdy enough to hold thick stock. They can sometimes shake or jiggle while in use. Also, the detents don’t always engage the way they should. The Delta Power Tools Homecraft H26-260L Miter Saw is a UL listed power tool. At 25 pounds, it’s lightweight and portable. It’s also one of our cheaper options for a high-quality power tool. It comes with a 3-year warranty that protects against product defects in materials and workmanship. This compound miter saw comes with the following attachments and accessories: 10-inch blade, dust bag, blade wrench, and manual. The Delta Power Tools Homecraft H26-260L Miter Saw is a favorite for small projects and light work. It’s an affordable power tool that’s worth every penny. The Festool Kapex KS 120 Miter Saw is a highly impressive power tool that’s perfect for heavy industrial use. It comes equipped with a 1600-watt battery that’s capable of reaching up to 3,400 rpm. This unit also comes with a 60 tooth carbide blade which is perfect for thin, smooth cuts. It’s a great product for cutting both hard and soft kinds of woods, as well as, plastics and steel. It features a handy hold-down clamp for securing all times of material while the tool’s in use. The Festool Kapex KS 120 Miter Saw utilizes a dual-laser design which guarantees perfect and precise alignment. The lasers are electronically powered for convenience and run on a 3-axis adjustment system for quick and simple fine-tuning. This power tool uses thin-kerf blades for less vibration, lower noise levels, and less stress on the motor. Its soft-start technology prevents sudden jolts, while its overload protection prevents overheating and malfunctions. This unit also comes with a FastFix system for safe and simple blade changes. It’s important to point out that the Festool Kapex KS 120 Miter Saw is extremely expensive. In fact, it’s the most expensive miter saw on our list. Because it features a fairly complicated design, it wouldn’t be a great option for a novice or new carpenter. Some people feel like this miter saw is a bit overpriced considering its 2 to 4-year lifespan. It really depends on what you consider a reasonable lifespan for a miter saw. The heavy-duty Festool Kapex KS 120 Miter Saw is crafted to pair with a variety of 10-inch blades. It comes with a swivel dust port, a dust collection hood, and a dust hood for collecting and clearing dust. This unit also comes with a 30-day money back guarantee and a 3-year limited warranty. The warranty protects against product defects in materials and workmanship. This compound miter saw comes with the following attachments and accessories: 60-tooth carbide blade, angle transfer device, wrench, and hold down clamp. Honestly, we felt that the Festool Kapex KS 120 Miter Saw was a great power tool. While it is a bit overpriced, it’s the perfect choice both light and heavy contracting work. Equipped with a 15 amp motor, this unit is capable of reaching a max no load speed of 3,200 rpm. It’s pre-wired to handle 120 volts and is capable of utilizing a variety of 12-inch blades. This miter saw’s maxed bevel capacity is set at 48 degrees. It comes equipped with a miter angle digital readout which guarantees straight, precise cuts to the 1/10th degree. Its dual-integral job site lights provide higher visibility for better cuts and even better results. The Milwaukee 6955-20 Dual Bevel Miter Saw comes equipped with constant power technology. This guarantees constant power and cutting speeds without malfunctioning or overheating. Its integral dust channel is capable of collecting up to 75 percent of dust, degrees, and wood shavings. This, intern, promises a cleaner, safer workspace. Its lever bevel is also capable of reaching between 0 to 48 degrees along both its left and right sides. The Milwaukee 6955-20 Dual Bevel Miter Saw’s dust port could be improved. It tends to clog pretty easily and it struggles to capture dust and wood shavings. This miter saw is also fairly expensive. It’s another high-priced product on our list. The Milwaukee 6955-20 Dual Bevel Miter Saw is crafted to pair with a variety of 12-inch blades. It also comes with an impressive 5-year warranty that protects against product defects in materials and workmanship. This compound miter saw comes with the following attachments and accessories: blade wrench, carbide tipped blade, and dust bag. The Milwaukee 6955-20 Dual Bevel Miter Saw was another favorite of ours. Although it’s a bit expensive, it has a long lifespan. It’s a durable piece of machinery that can handle heavy-duty use. The Makita LS1040 Compound Miter Saw comes equipped with a 15 amp motor that’s capable of performing up to 4,600 rpm. It features soft-start technology which is great for preventing rocking start-ups and glitches. Its electronic speed control allows you to set a constant speed while the miter saw is in use. It also comes with 9 pre-set positive stops for convenience and quick cuts. This miter saw is capable of reaching cuts between 0 and 45 degrees along its left, as well as, 0 and 52 degrees on its right. It’s designed to pair with a variety of 10-inch blades for perfect cuts with every use. At 27.3 pounds, the Makita LS1040 Compound Miter saw is a compact, lightweight, and portable power tool. It comes with a sturdy aluminum base which prevents shaking or jiggling. It’s also great for a wide array of woodworking, carpentry, and framing projects. This miter saw is guaranteed to provide smooth, perfect results with every cut. It also comes with a built-in illumination light, as well as, a dust port for preventing dust and shaving build-up. Honestly, the Makita LS1040 Compound Miter saw is a pretty great power tool. There’s not much that can be said about negative features relating to this miter saw. However, it’s important to mention that it’s not a power tool that’s built for heavy-duty use. It’s best for light contracting work and small projects. The Makita LS1040 Compound Miter saw is a versatile, powerful product that’s great for a wide range of projects. Designed with 9 positive stops, it’s designed to automatically stop at 15, 22.5, 30, and 45 degrees for convenience. It also comes with a 30-day money back guarantee and a 1-year warranty. The warranty protects against product defects in materials and workmanship. This compound miter saw comes with the following attachments and accessories: C.T. blade, dust bag, vertical vice, triangular ruler, and wrench. We were pretty happy with the Makita LS1040 Compound Miter saw. 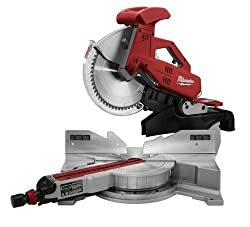 If you’re looking for a miter saw for a small home project, this might be one of your better options. Next up on our list is the TruePower 919 High-Speed Mini Miter/Cut-Off Saw. This product comes pre-wired to handle 110 volts. It comes equipped with a 90-watt battery that performs up to 7,800 rpm. This power tool features a 71-inch power cord for convenience and a longer reach. Along both its left and right sides, it’s able to reach bevel angles between 0 and 45 degrees. Weighing only 3.8 pounds, it’s the lightest miter saw on our list. It’s actually the cheapest miter saw on our list, as well. The TruePower 919 High-Speed Mini Miter/Cut-Off Saw is designed for completing small projects. It features a max cutting depth of 0.5 inches and it can pair with 2-inch blades. This miter saw also comes with a convenient table clamp which prevents shaking while the tool is in use. The TruePower 919 is a good option for any DIY-er with a small project. It’s capable of cutting steel, wood, and plastics easily. Its max cutting capacity is roughly around 1 ½ inches, so it’s important to keep this in mind. Because TruePower 919 High-Speed Mini Miter/Cut-Off Saw is so small, it doesn’t have a lot of power. It’s not great for large or long projects. You’ll want to steer clear of hard woods and hard metals, as well. Also, it’s important to note that this product has a lifespan of 1 to 2 years with occasional usage. 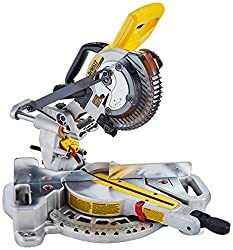 As stated before, the TruePower 919 High-Speed Mini Miter/Cut-Off makes a great miter saw for any DIY-er. With its compact design and lightweight frame, it’s very easy to take to and from locations. It’s one of the more portable miter saws on our list. Not only that, but it also comes with a 1-year warranty that protects against product defects in materials and workmanship. This compound miter saw comes with the following attachments and accessories: table clamp, 2-inch blade, and 71-inch cord. 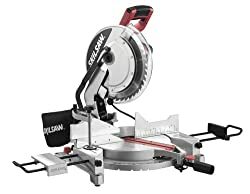 Cheapest miter saw on our list! The TruePower 919 High-Speed Mini Miter/Cut-Off is a good option for a DIY project or detail work. Simply put, it’s a miter saw that’s worth its price. The Chicago Pneumatic Sliding Compound Miter Saw is a crowd favorite. Equipped with a 15 amp motor, it’s capable of performing up to 5,000 rpm. It features an arbor size of 5/8 inches and a 6 ¾-inch power cord. This tool is designed to pair with a variety of 10-inch blades for convenience. Its maximum cutting depth at 90 degrees is set at 2 ¾ inches. At 29.6 pounds, it’s a lightweight, compact miter saw that’s great for taking to and from locations. The Chicago Pneumatic Sliding Compound Miter Saw comes equipped with a 60-tooth carbide blade for smooth, sharp cuts. It also comes with a dust bag which is great for collecting dirt, shavings, and debris while the tool is in use. This will help prevent dust build-up and it will help keep your workspace clean and orderly. Its complementary table clamp is great for preventing mistakes and accidents due to shaking or wobbling. This miter saw is a user-friendly option for any occasional carpenter or wood work. It’s important to note that this miter saw has a rather short lifespan. According to the average customer review, this product lasts for roughly 1 to 2 years. It’s not a good option for industrial or heavy-duty contracting work. It also struggles to complete square or cross cuts. The Chicago Pneumatic Sliding Compound Miter Saw features 45 degree tilts on both sides. It also comes with dual linear ball bearing rails which provide smoother sliding. While it doesn’t come with a warranty, it might come with a 90-day money back guarantee. You’ll want to contact the manufacturer’s customer service hotline to find out more about their money back guarantee. 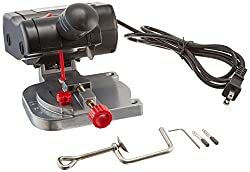 This compound miter saw comes with the following attachments and accessories: 60 tooth carbide blade, extension bars, dust bag, and table clamp. We weren’t extremely impressed by the Chicago Pneumatic Sliding Compound Miter Saw. It was a decent miter saw for light contracting work. Next on our list is the SKIL 3821-01 Quick Mount Compound Miter Saw. This power tool comes with a 15 amp motor that’s capable of performing up to 4,500 rpm. It features 9 positive stops for convenience and speedy settings. These stops include 0, 22.5, 31.6 and 45 degrees on both its left and right sides. Designed to pair with 12-inch blades, this miter saw can handle a variety of blade material types which guarantees the best results. The SKIL 3821-01 Quick Mount Compound Miter Saw comes with a thick dust bag which is great for collecting dirt, debris, and shavings. In turn, its built-in dust port prevents the build-up of dust while keeping your work space clean and safe. This dual-bevel miter saw comes with a handy Laser Cutline Guide which guarantees straight, easy cuts with every try. It also features an extendable table for larger projects and longer pieces of stock. Its quick-mount system promises quick and simple setups. Overall, it’s a great miter saw for new and professional contractors. Firstly, the SKIL 3821-01 Quick Mount Compound Miter Saw doesn’t come with a product warranty. Secondly, 46 pounds, it’s a bit heavy. Because it features a bulky, hefty design, it’s not the most portable product on our list. Finally, its laser guide system is a bit faulty. Other than these three points, it’s a fairly good miter saw for both professional and DIY projects. The SKIL 3821-01 Quick Mount Compound Miter Saw features a user-friendly design. It’s a popular option for both novice and experienced woodworkers. This miter saw is often sold in-store and online through 3rd party vendors. While it doesn’t come with a product warranty, many 3rd party vendor stores and websites may offer protection plans or money back guarantees. So, you can always look into those offers before purchasing this miter saw. 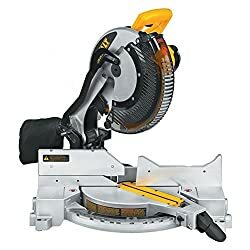 This compound miter saw comes with the following attachments and accessories: dust bag, extension bars, machined aluminum fence, cord storage hooks, and table clamp. Overall, the SKIL 3821-01 Quick Mount Compound Miter Saw is a great product. While it might not be best for heavy-duty carpentry work, it can definitely handle light work. The Black+Decker M1850BD Compound Miter Saw comes equipped with a 9 amp ball bearing motor which is capable of reaching 5,000 rpm. Along both its left and right sides, it features a miter range of 0 to 45 degrees. Its bevel range is 0 to 45 degrees on the left. This miter saw is crafted with a die-cast aluminum casing which makes it durable, sturdy, and long-lasting. It comes with 9 preset positive stops along both its left and right sides. Along with everything else, the Black+Decker M1850BD Compound Miter Saw comes with a 24 tooth carbide blade. It also comes with a handy Hold Down Clamp which helps to prevent shaking or wiggling while the unit is in use. This power tool features a built-in dust port and detachable dust bag for collecting debris and dirt. It has a handy laser guide system which guarantees straight, precise cuts with every use. Its blade diameter is set at 7 ¼ inches and it’s capable of pairing with any type of blade. The Black+Decker M1850BD Compound Miter Saw doesn’t come with a warranty. Unfortunately, the miter saw is a bit difficult to put together and the manual is hard to understand. Also, this unit doesn’t feature an adjustable depth function. 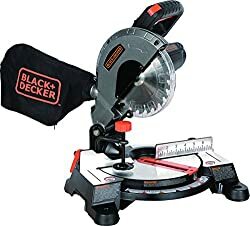 Most Black+Decker products are both sturdy and powerful. The Black+Decker M1850BD Compound Miter Saw is no exception. It’s an extremely low-cost miter saw that will provide precise, smooth cuts for years. At 17 pounds, it’s also lightweight and compact. However, it doesn’t come with a product warranty. You can always check 3rd party vendors for an additional protection plan. This compound miter saw comes with the following attachments and accessories: 24 tooth carbide tipped blade, dust bag, blade wrench, Hold Down Clamp, and manual. 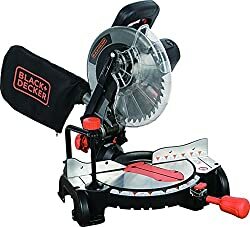 The Black+Decker M1850BD Compound Miter Saw is a good option for DIY-projects and light work. Affordable and lightweight, it’s a portable product that’s easy to take from one place to another. Its major fault is that it’s not very user-friendly. The DEWALT DWS779 Sliding Compound Miter Saw comes equipped with a 15 amp motor that’s capable of reaching 3,800 rpm. It features an exclusive back fence design that can cut up to 2 x 16 inches at 90 degrees, as well as, 2 x 12 inches at 45 degrees. Its CUTLINE Blade Positioning System provides perfect cuts with higher visibility and accuracy. This unit utilizes dual horizontal steel rails for more precise results. Its clamping mechanism keeps stock firmly in place while the unit is in use. The DEWALT DWS779 Sliding Compound Miter Saw has a miter range between 0 and 60 degrees from the right. On the left, its miter range is between 0 and 50 degrees. It comes with a super-efficient dust collection system which is guaranteed to collect up to 75 degrees of shavings and debris. Its built-in dust port is great for preventing the build-up of dirt and dust. This miter saw is crafted to pair with 12-inch blades for the best cutting results. It’s important to note that the DEWALT DWS779 Sliding Compound Miter Saw is a fairly expensive product. While it’s not considered extremely expensive by our team, it’s still far from being cheap. Weighing 67 pounds, it’s a bit heavy and bulky. It’s not the best miter saw for taking to and from multiple locations. The DEWALT DWS779 Sliding Compound Miter Saw features a powerful, impressive cutting system. It works wonders on thick steel, hard wood, and solid plastics. This unit also comes with a 3-year warranty. The warranty protects against product defects in materials and workmanship. This compound miter saw also comes with the following attachments and accessories: 10-inch blade, dust bag, blade wrench, and manual. We were pretty happy with the DEWALT DWS779 Sliding Compound Miter Saw. It comes with a decent amount of complementary attachments and accessories. While it is a bit expensive, it has a long lifespan. The Rockwell RK7136.1 Shop Series Miter Saw is a great product that comes equipped with a 14 amp motor. Pre-wired to handle up to 120 volts, it features a max no-load speed of 5,200 rpm. It’s entirely made of thick, sturdy die-cast aluminum for a longer lifespan. Weighing 44.8 pounds, it’s light enough to be carried around a construction site with little effort. Its bevel can reach between 0 and 45 degrees with 9 pre-set stops. It also comes with a set of sturdy metal legs for additional stability and height. The Rockwell RK7136.1 Shop Series Miter Saw comes equipped with adjustable rollers for further outfeed and infeed support. Its support accommodates the standard 2 x4 inch stock at a max of 10 feet. This product comes with a handy dust bag which is great for collecting shavings, dirt, and debris. It features a back fence for straighter cuts. This unit is designed to handle a variety of 10-inch blades which provides better results and smoother cuts. Unfortunately, the Rockwell RK7136.1 Shop Series Miter Saw’s leg stand is bit faulty. It can’t support thick, heavy stock. So, if you need to cut a large piece of stock, you’ll want to place the miter saw on a firm surface. The blade also tends to wobble if used on harder materials. Even with its clip on metal legs, the Rockwell RK7136.1 Shop Series Miter Saw is a fairly inexpensive product. It’s very easy to use, maneuver, setup, and teardown. This unit is a great option for DIY-ers and occasional carpenters. It also comes with a 2-year limited warranty that protects against product defects and workmanship. This compound miter saw also comes with the following attachments and accessories: work clamp, 10-inch miter saw, and dust bag. The Rockwell RK7136.1 Shop Series Miter Saw is a decent project. It’s a good option for a low-cost DIY project or an occasional carpenter. Unfortunately, its average lifespan is unknown. The WEN 70716 Sliding Compound Miter Saw comes with a 15 amp motor that’s capable of reaching 5,500 rpm. Its bevel range is between 0 to 45 degrees on its left, while its miter range is from 0 to 52 degrees on both sides. This miter saw is able to handle stock materials as thick as 3 ¼ inches thick. Its table is large enough to support up to 11 ½ inches in depth. It also comes with a 60 tooth carbide blade for smooth, precise cuts. It’s a reliable, sturdy miter saw that provides perfect cuts and perfect results with each use. The WEN 70716 Sliding Compound Miter Saw comes with a dust collection bag that limits dust and debris build-up. 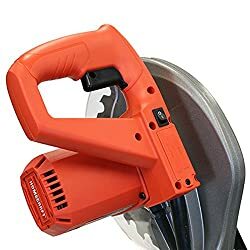 Weighing 37.5 pounds, it’s a portable power tool that’s great for taking around a busy job site or garage. It’s designed to handle a variety of 10-inch blades which is both convenient and helpful. It also comes with a built-in carrying handle for portability. Its automatic blade cover retracts once the miter saw is turned on. It then extends back out when the product is turned off. This is great for minimalizing accidents and guaranteeing product safety. The automatic blade cover is a bit faulty. Sometimes it doesn’t retreat like it should. You can always call WEN’s customer service hotline, but honestly, they’re not the best either. They have the tendency to put the callers on hold for long periods of time. Finally, the fence may not be perfectly straight. You should check this by making a few practice cuts, beforehand. 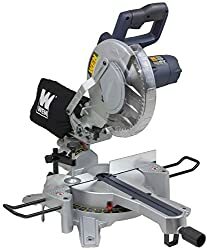 The WEN 70716 Sliding Compound Miter Saw is an affordable, user-friendly product that’s reliable in multiple working conditions. It’s the perfect option for a novice or advanced woodworker looking for a simple, sturdy miter saw. It also comes with a 2-year warranty that protects against product defects in materials and workmanship. This compound miter saw also comes with the following attachments and accessories: fence, hold down clamp, and 60 tooth carbide blade. We were pretty happy with the WEN 70716 Sliding Compound Miter Saw. It’s a good product with a ton of potential. The automatic blade cover was a creative touch. Also, the built-in carrying handle was very helpful. This miter saw features a handy, cordless design which makes it more portable than the common miter saw. Equipped with a 20 volt max battery pack (DCB204), it features an impressive no load speed of 3,750 rpm. It’s designed to hold a variety of blades up to 7 ¼ inches in diameter. It has a 45-degree miter cut capacity of 2 inches, while it’s max width (at 45 degrees) is set at 5 ½ inches. Its 90 degree cross cut capacity is set at 8 inches. The DEWALT DCS361M1 Max Cordless Miter Saw comes with an adjustable stainless steel detent plate. Its plate features 11 positive stops for improved accuracy and convenience. This unit comes with the Integrated XPS cross cut positioning system for smoother, more precise cuts due to higher visibility. Its machined base fence improves cutting accuracy; while the oversized bevel scale makes adjusting the bevel’s angles a simple and easy task. Because the DEWALT DCS361M1 Max is a cordless miter saw, it’s fairly weaker than the majority of our choices. While it can handle light contracting work pretty easily, it’s not a great option for heavy-duty usage. Also, it’s a bit expensive. However, it’s not outrageously pricey. It does require lithium-ion batteries to run, but it comes with a set. The DEWALT DCS361M1 Max Cordless Miter Saw is a great little power tool. Compact and lightweight, it’s portable enough to carry around a job site. It also comes with a 3-year warranty that protects against product defects in materials and workmanship. This compound miter saw also comes with the following attachments and accessories: 20V max battery, blade wrench, DCB112 12 20V max charger, carbide blade, users guide, and material clamp. The DEWALT DCS361M1 Max Cordless Miter Saw is a handy unit. Its battery power design doesn’t limit its cutting capacity, but, instead, it improves its portability. It really is the best cordless miter saw you can buy. The last product on our list is the Evolution Power Tools RAGE3 Multipurpose Sliding Miter Saw. This power tool comes equipped with a 15 amp motor, pre-wired to handle 1,800 watts with a soft start. The soft start function guarantees that the unit will turn on without chugging, shaking, or other malfunctions. It’s a great product that’s capable of reaching a max no load speed of 2,500 rpm. This unit is designed to handle a variety of 10-inch blades for perfect, accurate results. The Evolution Power Tools RAGE3’s max blade arbor is set at 1-inch; however it comes with a dual flange for 5/8-inch blades, as well. Also, its max width for 90 degree miter cuts is set at 11 13/16 inches, while 45 degree miter cuts are set at 8 ¼ inches. Its max depth for 90-degree bevel cuts is set at 3 inches, while 45 degree bevel cuts are set at 1 ½ inches. It comes with a laser guidance system for accurate cuts with high visibility. There are 2 major faults to the Evolution Power Tools RAGE3 Miter Saw. The first is that its guidance laser is a bit faulty. Sometimes it flickers or refuses to turn on. Also, it might not be perfectly straight, so you’ll want to try some practice cuts beforehand. Secondly, it’s not the best at cutting steel. It can handle hard woods fairly well, but it tends to struggle with steel. The Evolution Power Tools RAGE3 Miter Saw can easily cut through steel, aluminum, wood, and even plastics. It’s a reliable sliding miter saw that won’t disappoint. It also comes with a 3-year limited warranty that protects against product defects and workmanship. This compound miter saw also comes with the following attachments and accessories: built-in laser guide, carbide blade, dust bag, and table clamp. The Evolution Power Tools RAGE3 Miter Saw is a low-cost product that’s worth every cent. While it might not be one of our favorites, it’s definitely a miter saw that deserves a closer look. Now that we’ve looked at the top 20 miter saws of 2019, let’s look at the actual shopping process. When you have to find the perfect miter saw for you or your shop, you have to consider a variety of factors. These factors include blade size and type; rather it’s a bevel or compound miter saw, speed, motor, and few other features and functions. In this next section, we’ll be looking at each factor you have to consider when shopping for the best miter saw. Most miter saws feature either a 10-inch or 12-inch blade diameter. 12-inch blades, or larger, are typically used for bigger projects. It’s the common blade length for a professional miter saw. 10-inch blades, or smaller, are common for small projects, such as DIY work or simple wood framing projects. While 10 and 12-inch blade diameters are considered the most popular, there are plenty of miter saws that feature larger and smaller sizes. The cordless DEWALT DCS361M1 Max features a 7 ½-inch diameter. This may be because it’s designed for more detail work. Deciding rater or not you need a single or double bevel miter saw really depends on the job you’re planning on completing. The main difference between a single and double bevel miter saw is that a single forces you to manually flip the material over to make angled cuts on both sides. A double bevel miter saw is a lot easier to use. This is because the saw actually swings around, itself, to make angled cuts. So, Single-bevel saws are simple and cheaper. However, you have to manually flip the material to make angled cuts. Double Bevel saws provide quicker results because the saw, itself, swings around the material. However, it can be heavier and more expensive. There are 3 basic types of miter saws: standard, compound, and sliding compound. They typically vary based on price, weight, and ability. 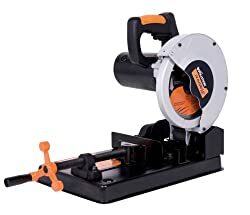 Standard: this type of miter saw comes with a fixed pivot blade. The saw, itself, stays vertical except when the table is tilted. This type is fairly easy to maneuver and it’s usually lightweight and low-cost. Compound: A compound miter saw allows you to cut horizontally and vertically. The pivot can rotate vertically while the table continues to tilt horizontally. Besides the sliding compound, this type is typically the most popular. That’s because it’s affordable and easy to use. Sliding Compound: Like the compound miter saw, the sliding compound can cut vertically and horizontally. It also comes with additional arms on the cutter head for making thicker, wider cuts. This type of miter saw is quite common for a professional-quality power tool. It’s also pretty expensive. Most miter saws come with a dust port. However, not every miter saw comes with a dust bag or dust collection system. Dust bags: These are important because they actually collect debris, shavings, and dust while the unit is in use. This prevents dust and debris from blowing around your workspace, which can be potentially dangerous or, at least, annoying. Dust collection system: an additional dust collection system is particularly helpful for collecting the most debris while the saw is in use. It will also help keep the unit from overheating or malfunctioning from a buildup of dirt. When you’re considering the saw’s power and speed, you’ll want to look at Revolution per minute (RPM) and amperage (amps). RPM: this generally refers to the amount of cuts per minute. The higher the rpm, the faster the saw. Amperage: Amps basically mean that the unit is powered by electricity. The higher the amperage the better the cutting power. Most of the miter saws on our list feature a 15 amp motor. This is fairly common for a powerful miter saw. However, 10 amps and 12 amps are also fairly popular. You may find compact miter saws with a 10 amp motor. These are good options for a small, DIY project. This factor is largely determined by the buyer. It’s up to you how much you’re willing to spend for a miter saw. However, it’s important that you purchase a miter saw that’s worth its price. Just because it’s expensive doesn’t mean that it’s good. Warranties protect against product defects in materials and workmanship. They can come in 1, 2, 3, or more year packages. In the end, they can save you a lot of money from replacement parts or repair fees. This typically refers to additional accessories that come with your purchase. Complementary accessories save you money from having to purchase them separately. Ask yourself what you’re planning on using the miter saw for. Are you a professional contractor or a DIY-er? Do you plan to complete large complicated jobs or the occasional project? If you’re a DIY-er or a novice, you might want to start off small. This means single-bevel, standard miter saw with low amperage. These types of miter saws are typically cheaper and easier to use. While they might not last for years, you can always buy a more advanced miter saw later on. On the other hand, a professional should consider a double-bevel, compound or sliding miter saw with a 15 amp motor. It’s up to you how heavy you’d like it. If you plan to move around a busy job site, then look for a unit that weighs less than 50 pounds. However, heavier miter saws or less likely to wiggle or jerk around while in use. If you’re going to moving around a lot, then you’ll need a lightweight miter saw. Possibly a cordless unit if you’re not going to be near an electrical outlet. Consider purchasing extra batteries. If you’re working in a small workshop or garage, you should definitely consider a solid dust collection system. This will prevent dust and debris from blowing around your work space. Consider how comfortable and experienced you are with miter saws. You don’t want to waste your money on a bulky, expensive power tool that you don’t know how to use. Many expensive miter saws come with a variety of complicated features and functions. An inexperienced carpenter may not know how to use these features and basically waste their money and the unit’s features. It can also be very dangerous. So, again, I recommend that newer carpenters should consider a single-bevel, standard miter saw with low amperage. These types of miter saws are typically cheaper and easier to use. Meanwhile, more advanced carpenters can consider a double-bevel, compound or sliding miter saw with higher amperage. After reading through our miter saw review, I hope you’ve found exactly what you were looking for. There are a wide variety of miter saws. Some are lightweight, compact, and perfect for light contracting work. Others are sturdier, heavy, but can keep up large amounts of work without slowing down. Our list accurately displays each miter saw so that your choice can be easier and quicker. I encourage you to choose a reliable miter saw from our list that best suits your needs. Doubtlessly, you’ll find that whichever unit you choose will serve you for years to come. 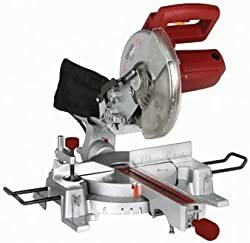 Overall, I hope you enjoyed our in-depth review of the best miter saws of 2019. As always, I encourage you to write a review of your own. If you agreed with our top 20 choices, go ahead and write why. Did you disagree with our choices? Have you purchased any of these miter saws before? If so, when and how did it perform? Which miter saw do you think is the perfect professional woodworking tool? Also, which miter saw do you think should be included in a woodworker’s arsenal?